As I was pondering today’s post, I realised that the last few posts have all been sweet things; goes to show what our body craves when we are fasting! That’s very true, at least for me, that after a day of fasting, I was going insane for something sweet. Despite having dates with which to break our fast, I still had the urgent need for some down right unhealthy sugar. Apart from what I posted here during Ramadan, I didn’t make anything else. There just wasn’t any time, that and I was exhausted! I relied on ice cream, lots of ice cream. Let me tell you that Talenti Gelato makes an awesome salted caramel gelato and caramel cookie crunch…yum. I lived off these two flavours every night. Now, that I am not so exhausted from late nights, I am thinking to put my ice cream maker to use making my own. It’s been neglected this summer. I’ve been, looking at all these delicious sorbets, ice creams and lollies people have been posting all over the blogosphere, and after I drool uncontrollably all over my iPad, I think that it’s about time I made some. I put both my ice cream bowls in the freezer at the first hint of summer and they’ve pretty much sat there chilling. Time to change that. Before I get to my late posts on ice cream (it’s beginning to feel like fall here already), I have some residual Ramadan posts left. I had a couple of recipes I wanted to share during Ramadan but lack of sleep, fatigue and hunger just zapped my energy. I don’t want to wait till next year because you can make these any time and so I will share them over the weeks. First up, is this Egg Roll Borek which happens to be a cross between an egg roll with ground beef and cabbage that my husband loves, and a stuffed phyllo strudel or borek stuffed with potato and feta cheese that I love. Every Ramadan one of my husband’s requests is egg rolls. I hate frying, did I mention that already? I only fry when the stuff absolutely cannot be baked, but if there is a baked version, I am all over it! So, to make something that I didn’t have to fry and to satiate my husband’s egg roll craving and my craving for borek, I made this jumbled up version. What a wonderful creation it turned out to be! One of my most favourite Bosnian delights is their borek. Traditionally, a true borek is filled with only beef and some onions, and every other filling is known as a pie. I love them all, borek or pie, they are all delicious. I have wonderful Bosnian friends who make amazing borek and I am hoping to learn from them very soon. Meanwhile, though this not a true borek by any means, I liked the sound of my Egg Roll Borek creation so here it is! This does involve making your own phyllo dough. 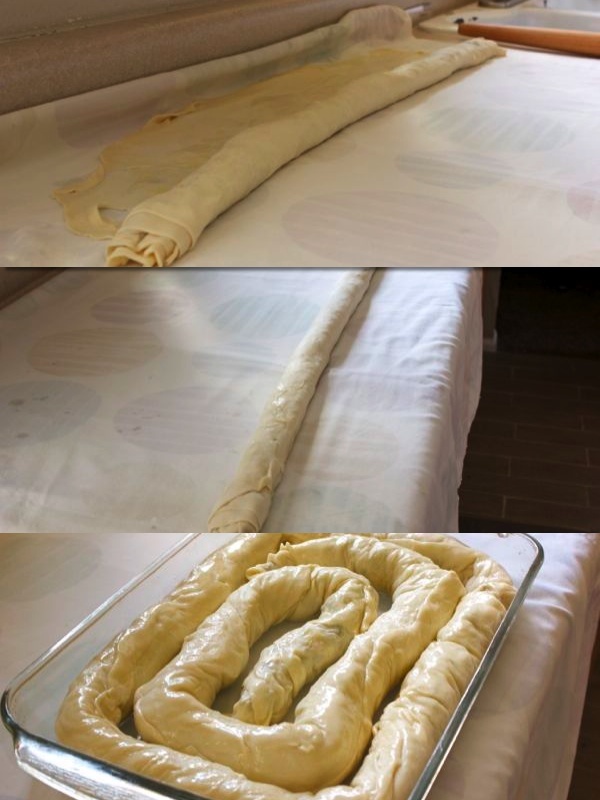 If you make strudel, then it’s no big deal at all. If, however, you have no inclination of pulling dough paper thin all over your counter and stretching it here and there, and then filling it and rolling it delicately, then by all means use store bought phyllo. If you want to make it in pie form, check out my Potato and Cheese Phyllo Pie for directions and if you want to make rolls, check out my Kale, Feta and Potato Phyllo Rolls. This recipe for strudel/phyllo dough is shamefully over due. One of my readers asked me to post it a while back and I just never got to it. Here it is today, finally. Crispy homemade phyllo borek stuffed with egg roll stuffing of cabbage, ground beef, feta and potatoes. 1 egg and a drizzle of milk to brush on top. If you are going to pour the egg-milk mixture over the top, use ½ cup of milk and an egg. Heat the oil in a large frying pan and add the green onions, garlic and ginger until fragrant. Add the shredded cabbage and toss around until the cabbage is wilted and the liquid evaporates. Add the ground beef and heat through. Cool the mixture before adding the potatoes and feta cheese. Once the cabbage and beef mixture is cool, add the boiled potatoes and feta cheese and mix through making a cohesive filling. Add parsley and check for salt. Remember that the feta is salty so be careful adding salt. In a bowl of a mixer, add the flour and salt and mix. Add the water, olive oil and vinegar. Allow the mixer to run with a dough hook for about 5/10 minutes until the dough is smooth and soft. Wrap the dough in plastic wrap and let sit for an hour or so before rolling. When it's time to roll, cover a table that you can walk around, with a patterned sheet or tablecloth. Flour the sheet or tablecloth quite liberally. Place the dough on the table and start rolling with a pin first. In between the rolling, use te back of your hands to roll and stretch the dough thin. I alternate between the rolling pin and pulling by hand. Just keep rolling and pulling until you get a nice the rectangle. Walk around the table pulling the dough equally from all sides. Gravity helps too by pulling the dough to the edge of the table and letting it hang. You won't be able to get it as thin as a commercial piece of phyllo but the texture of homemade phyllo is incredible. If you get tears, you can fix it by overlapping and pinching the dough. Most of the time, the tears will roll up and end up being sealed anyway. This amount of dough will make a rectangle about 24 inches by 30 inches or so. When you have pulled it as thin as you can get it, is time to fill. You should be able to see the pattern of the sheet or tablecloth through the dough. Trim the thick edges all around the phyllo rectangle using a pizza cutter. Layer the filling in a log shaped layer along the long end of the rectangle. Using the sheet, roll over the phyllo dough onto the filling. 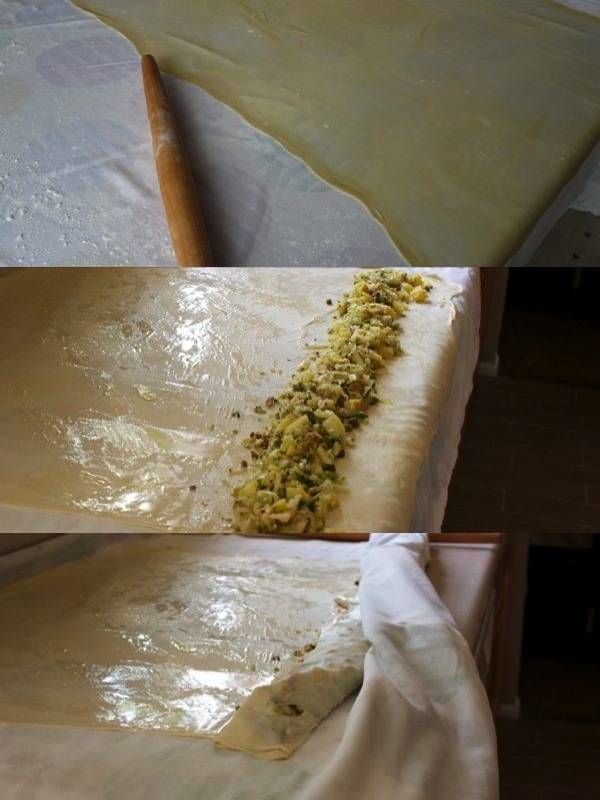 Roll the phyllo dough using the sheet to help, by pulling the dough onto itself. You can use your palms too to roll the borek/strudel tighter. Once the dough is all rolled up, place in a greased baking sheet or baking pan. To get the egg roll shape and a crispy texture, keep the roll separated on the baking sheet and brush with egg-milk mixture. To get a softer texture, you can roll the dough tightly around in a coil and pour over the egg milk mixture before baking. This will give you more of a pie. Bake at 375 for 45 minutes or until golden brown and crispy. 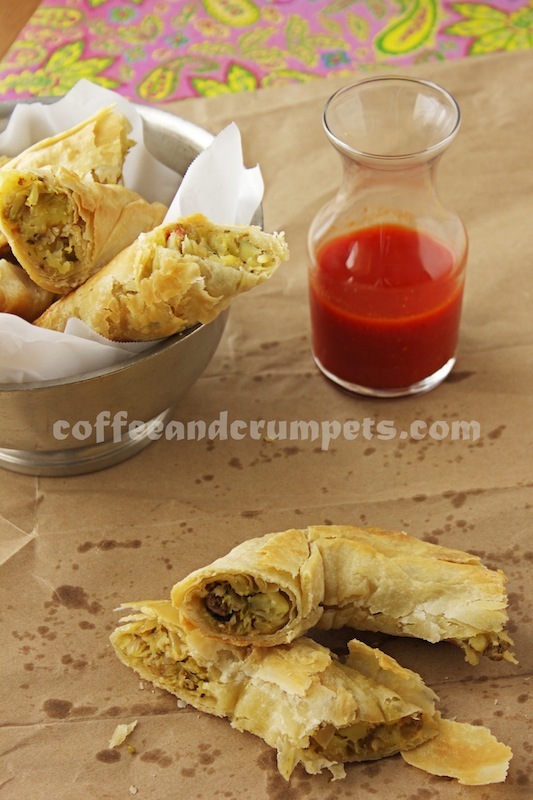 Hope you enjoy my egg roll/borek creation, they really are quite tasty and can easily become vegetarian by taking out the ground beef or something totally different by exchanging the filling with ones you like. The true flavour is in the handmade phyllo though, so if you have time, have a go. It’s really quite easy and once you make it, you will make it again and again. Hope you all have great things planned this weekend. I am getting ready for back to school with the kids and trying not to look too overjoyed as I plan lunches and shop for clothes and school supplies. Imagine, this time next week, they’ll all be in school!!! Hope you have something to smile about this weekend too :)! Kudos on making your own phyllo dough. That’s a huge feat!! Thanks! Homemade phyllo is pretty amazing! Making and rolling your own phyllo dough must have been so much fun! I can’t wait to try doing that. The egg roll borek looks phenomenal! Thanks! Once you get the hang of rolling it, it is quite fun! Especially since you watch it getting thinner and thinner. Oh we call it filo here too, flips between the two. Yeah, the whole sheet on a dining table is the cool part! It’s fun though once you get a hang of it! I am beyond impressed. This looks phenomenal and wish I could bake like you. Amazing!!! Wow, Nazneen! I’m super impressed! I don’t know if I can make phyllo dough from scratch. You make it seem so easy though. I’m with you..I HATE frying so I the oven is my best friend when it comes to making food crispy. I’ve never heard of borek before and I love that everytime I visit your page, I learn something new ;). Hi Min! Thank you for such a sweet comment, I appreciate the kind words! I love the oven too, but I also love fried foods, I just don’t like frying! I love egg rolls and cook the way how Kathi rolls are done. I checked your other post with kale rolls, Now you have me another idea to use massaged kale in phyllo sheets. Egg rolls are great to stuff with a variety of vegetables and leafy greens. I love the SW ones with chicken, black bean and corn. Yummy! Thank you, thank you! I love fried food, but I just don’t like frying, the smell, the mess, the waste of oil! I love eating at other people’s homes!! Gosh I admire you! I’ve never made my own phyllo dough, and you make it look so easy. Nevertheless, I think I’ll stick to the packaged stuff. 😉 Love the idea for these egg roll boreks. I didn’t know that a true borek had only beef and onions in it. No matter, I’m still going to call the “pies” boreks (I really like the spinach ones). Terrific recipe today – thanks. Thanks John! Packaged stuff is definitely convenient and I do always have a package in my freezer. I know in Bosnia, the true borek only has beef and onions but there are boreks in the surrounding countries and I think they can have any filling. I love the spinach and cheese one also. I tried to make phyllo dough only once with terrible results. I’ll follow your recipe step by step. Thank you for sharing! You’re welcome! Thank you for stopping by. Let me know if it turns out for you this time. Thanks John! I was scared the first time I made it, wasn’t sure how it would turn out but it was easy and I’ve been gaining conference since. You roll out pasta all the time, this would be easy for you! Wow! That is so cool! First, the dough being stretched bigger than I thought you had counter for, then wrapping it as a worm and baking it – no way! I love your taste in ice cream. I took my ice cream canister out for Ramadan, now I have to put it back. Haseeb is getting some 40 pounds of organic peaches in a couple of weeks from coloradopeach.com I think. They deliver around here, you just order and pick up. But, looks like I’ll be canning, freezing, making preserves, pies and ice cream – what’s your favorite – I’ll drop it by. Glad you made it through Ramadan! I’m still exhausted. I cleaned my house for the first time yesterday and it’s still a disaster. Oh, well. Thanks Asha! It’s pretty easy once you get the hang of it and do it often enough. I’m sure you’ll have no problem perfecting yours. Hi Nazneen, there have been a lot of desserts lately, all truly scrumptious though. This really does it or me though. I can’t believe you made your own pastry, it looks amazing. Lots of brownie points for that. David Crichton recently posted..Roasted Cod with Wild Fennel Pollen and Truffled Puy Lentils. Thanks Dave! Once you’ve made it, its pretty easy after that. ugh, I hate the smell too. You will never get it as thin as commercial but it gets pretty close. Yes, it tears but it’s easy to patch up. Wow, a month, I forgot we go back to school in September in the UK. Have fun! This is a work of love, Nazneen!!! These rolls look crispy and quite delish. I think their filling is more appetizing than the one of a regular egg roll. I’d love to try them. Denise Browning@From Brazil To You recently posted..Rainbow Butterfly Cake with Cloud Buttercream Frosting: Happy Birthday, Hannah!!! Thanks Denise! They turned out quite well.